A team at the UW Health DeForest-Windsor clinic is in the final stages of a three-year quality improvement project aimed at better supporting family physicians who provide obstetrics care. 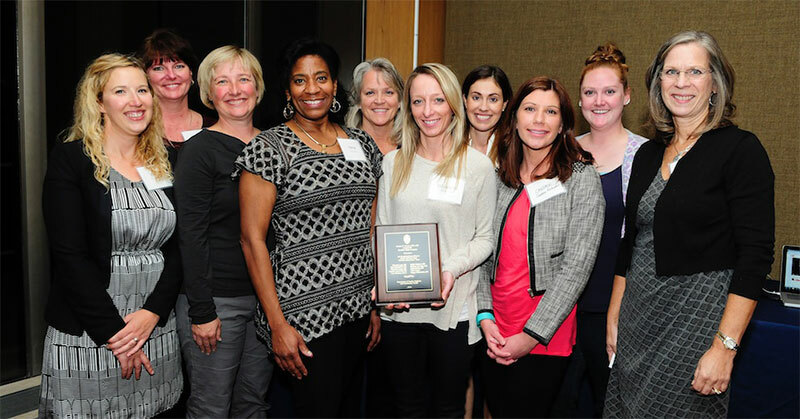 Their efforts resulted in a formalized model for OB team-based care and earned them a 2016 UW Department of Family Medicine and Community Health (DFMCH) James E. Davis, MD, MS, Quality Improvement Award. Team leads Jackie Gerhart, MD, and Linda Kiefer, RN, launched the project in 2013 in response to challenges reported by family physicians providing OB care. One of those challenges was patient access. When the project began, Dr. Gerhart was the only family physician at the DeForest-Windsor clinic who provided OB services. But in the project’s first year, physician assistant Lisa Simpson, PA-C, began providing OB care under Dr. Gerhart’s mentorship, ultimately taking on 22 to 24 percent of all OB patient encounters. In the second year, Bethany Howlett, MD, joined the clinic as an OB provider and contributed to the further creation of the OB team care model. The team also collaborated with the UW Department of Obstetrics and Gynecology to develop protocols for nurses interested in providing care for OB patients. These protocols formalize evidence-based medical guidelines for commonly seen aspects of prenatal care, giving nurses the knowledge they need to better support patients and physicians. Specifically, an RN manages the patient’s first OB visit, which includes patient education, ordering routine labs, and communicating normal lab results. The RN also assists with miscarriage diagnosis and counseling, allowing the patient more timely care in sensitive situations. The team presented the care model at the American Academy of Family Physicians’ National Conference on Family-Centered Maternity Care, held in Madison in August 2016. Over the next six months, the team will continue to roll out standardized materials for patient education, workflow and clinical best practices across all UW Health obstetrics and gynecology and family medicine community clinics that provide OB care. Congratulations to everyone on the team for their great work!